Refractory is a class of materials which are produced from non-metallic minerals. These are primary materials that are used in the internal lining of industrial furnaces and are used in steel, aluminum, glass, cement, petrochemicals, non-ferrous materials, thermal plants and ceramic Industries. The value of refractory is not merely judged by the cost of material but also by the nature of job/ its performance in a particular situation. The fortunes of refractory Industry is directly related to the growth of iron and steel industry, which consumes a mammoth 50%-75% of total refractory produced. In 2007, the world refractory demand was 38.1 million metric tons valued at $22.9 billion, while in 2012, the corresponding figures for 2012 are projected at about 45.2 million metric tons at $28.5 billion. 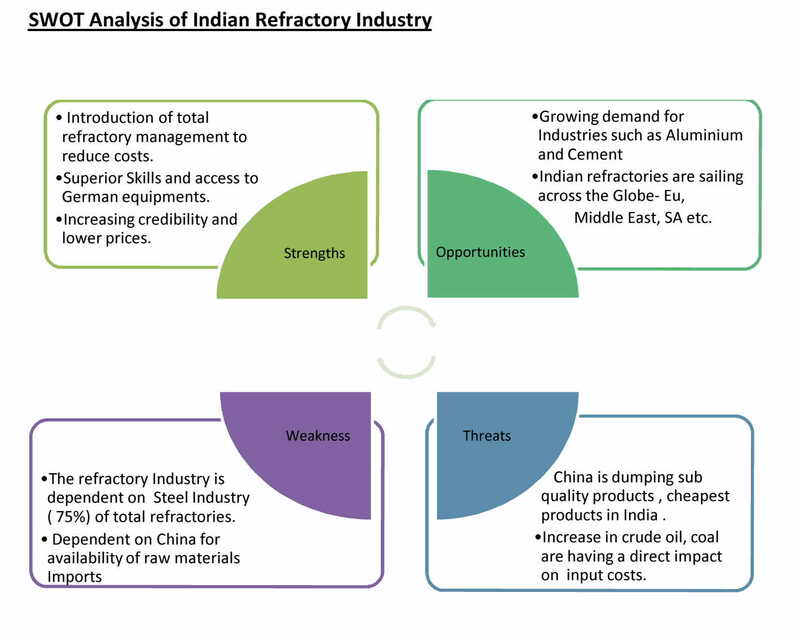 The Asia Pacific region is expected to account for 69% of total volume, with China becoming the dominant producer and consumer of refractory materials. As far as global production is concerned, China accounts for 40% of global output in 2011.Other leading countries in the production of refractory are United States, Japan, Russia, Germany and Brazil. 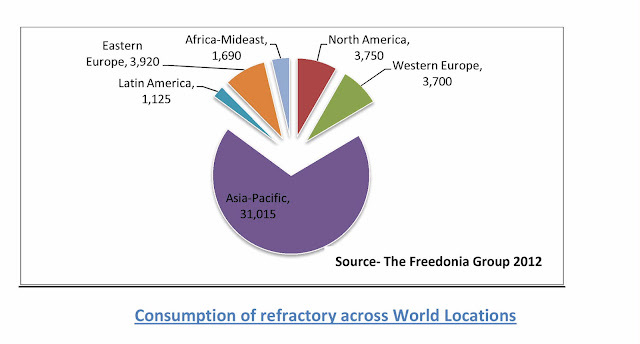 China is the leading exporter of refractory with total worth of $ 840 million in 2007. On a broader scale, Refractory can be categorized into two major categories: Clays, which are naturally occurring Alumina-silicate materials, and Non-Clays, which are manmade materials. Common clays include Fireclay, Flint clay, Fire brick, high-alumina, kaolin, and Ladle brick. High-alumina is the one most widely used in commercial settings, followed by Fireclay and insulating Fire brick high-alumina, kaolin, and Ladle brick. High-alumina is the one most widely used in commercial settings, followed by Fire clay and insulating Fire brick. 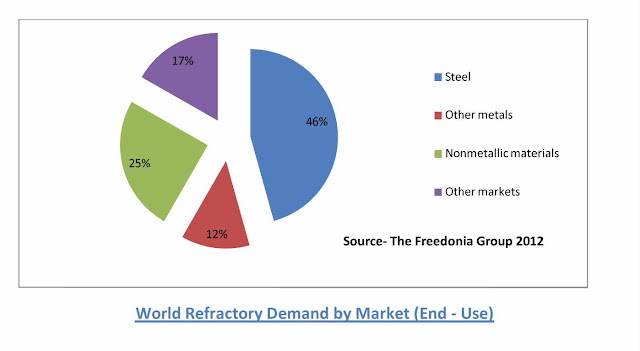 Steel has historically been the largest market for refractory; its share will slip from 59 percent in 2002 to 46 percent in 2012, but it will still be more than twice as large as any of the other other metals, nonmetallic minerals and all other materials. The steel-maker accounts for the largest consumption of refractory and this sector is attractive to leading suppliers such as RHI, ANH, Vesuvius, Krosaki Harima, Saint-Gobain, Magnesita, Chosun, and Shinagawa. These leading organizations have long cultivated “customer relationship management” with major steel producers and are fully aware of steel making technology and industry tradition. Steelmakers also insist on extensive maintenance to extend the life of their furnaces rather than opt for complete relining; this means market opportunity for makers of gunning mixes and other low-cost forms as opposed to sellers of higher-cost bricks. 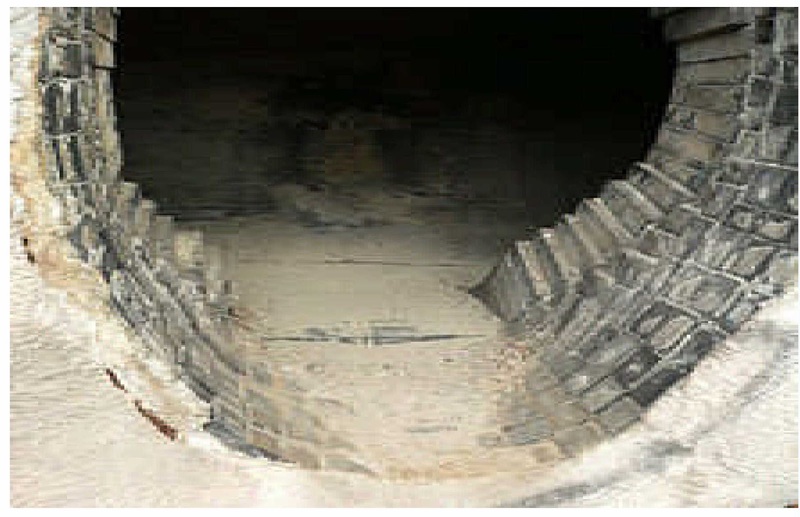 A new trend is “zoned refractory linings” that utilize different refractory products in various areas of the furnace. In the case of other metals, aluminum and copper producers are the two largest users of refractory, based on output rates for the two metals and the need for heat-resistant materials in their production. Other markets include producers of lead, nickel, silver, zinc, and others, as well. No one market is dominant; at the same time, since requirements can be unique, special refractory goods are in demand. For example, waste-to-energy and co-generation plants use silicon carbide products for their durability and high heat transfer capability. 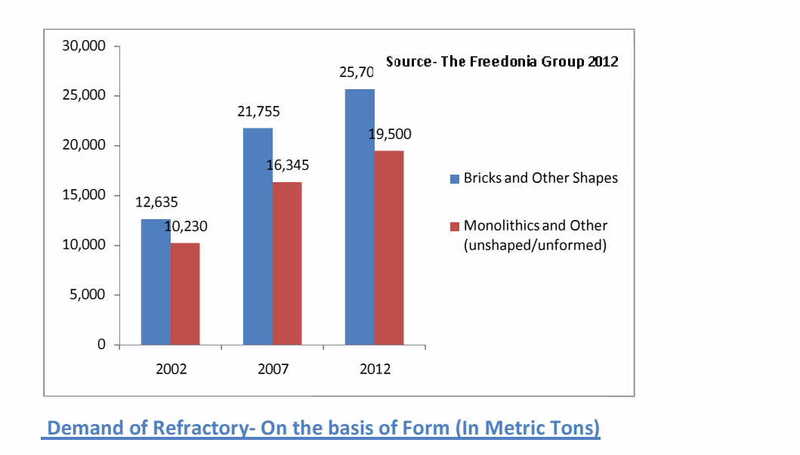 Still, the bulk of sales rely on traditional materials such as ﬁre-brick. The refractory industry is less dependent on the construction, automotive and packaging and more dependent on heavy Industries such as metals and especially steel making. There is a considerable consolidation in the refractory Industry. The top seven companies have 25% of market share in the global refractory market. 1. The major Manufacturers of Refractory: - RHI, Vesuvius (Cookson Group), Korsaki, Harima, Magnesite, Shinagawa, Chosun, ANH, Saint-Gobain, Minteq (Materials Technologies), Allied Mineral products, Morgan Crucible, and Resco Products. 2. 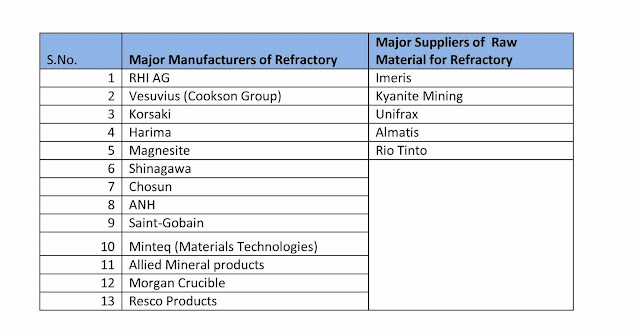 The major Suppliers of raw materials for Refractory: - Imeris, Kyanite Mining, and Unifrax. Imeris; through its C-E Minerals subsidiary, has a joint venture in China called Guizhou Star Minerals. Other suppliers are Almatis and Rio Tinto. Competition in the industry takes various forms. Innovation and new product development is an example, as companies strive for product differentiation along with more “hands-on” service. The emphasis is shifting from mere cost cutting and longer lasting goods to custom designed solutions for both new installations and for major maintenance-repair assignments. Like in other manufacturing and service sectors even in the refractory Industry, smaller ﬁrms are being acquired for their expertise as large ones seek technical knowhow, diversiﬁcation, or economies of scale. Imerys of France was one of the most active acquirers at the end of the past decade, purchasing ventures in Australia, China, the United Kingdom, and the United States as it broadens its raw material base and expands into other refractory products. Cookson bought part of Foseco (both in the United Kingdom), but then sold off one division to expedite antitrust clearances. Korsaki Harima acquired another Japanese ﬁrm, while Magnesita of Brazil bought a German ﬁrm from Rhone Capital of the United States. Refractory companies are also involved in the joint ventures. Such arrangements are done to gain access to new technology, expand geographic reach, recruit customers, and achieve greater market influence. Imerys has been active here too, forging joint ventures with Chinese investors. Almatis (Germany) linked up with Morimura Brothers (Japan). China has been a popular location for numerous joint ventures. 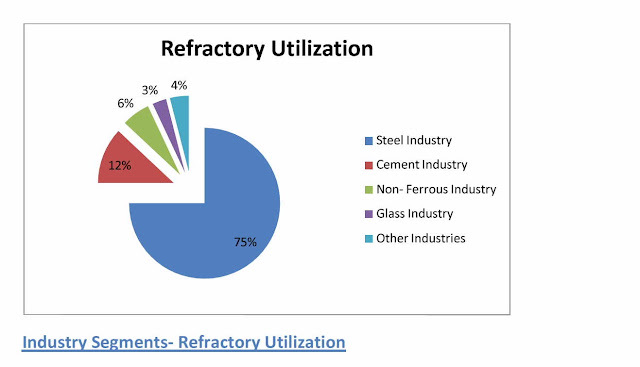 The advancements in the technology along with ceramic and metal processing technology, there is a continuous decline in the consumption of refractory. In 1970, refractory consumption was about 30-50 pounds per ton of steel produced. In 2007, it is about 10-20 pounds per ton while in the most advanced plants, it is below 10. Global level, price changes come slowly, however, from $600 in both 2002 and in 2007 to an estimated $630 in 2012.This difference in prices at global level and in Europe can be explained by the availability of refractory at lower prices in China. 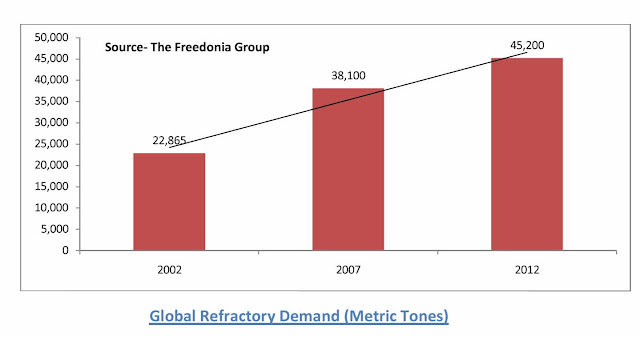 The average price of refractory in China in 2007 is $450 and is expected to reach $495 in 2012. The price arbitrage opens up the vast opportunities of exports from China and other Asian countries to Europe and North America. 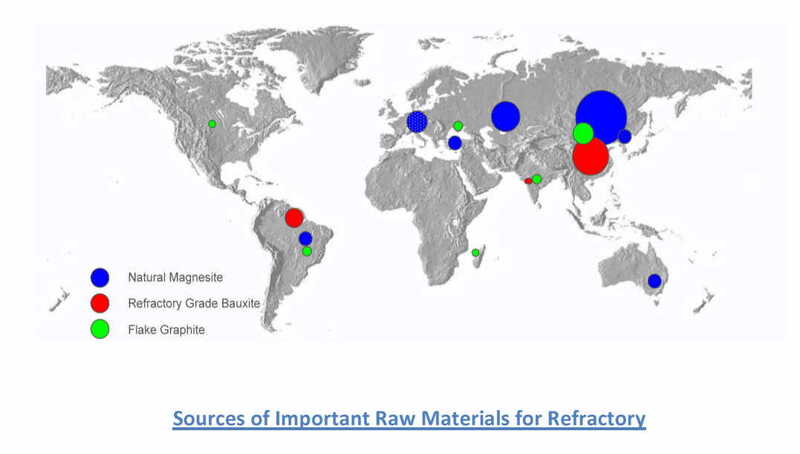 Raw materials are major concern for the Refractory Industry. 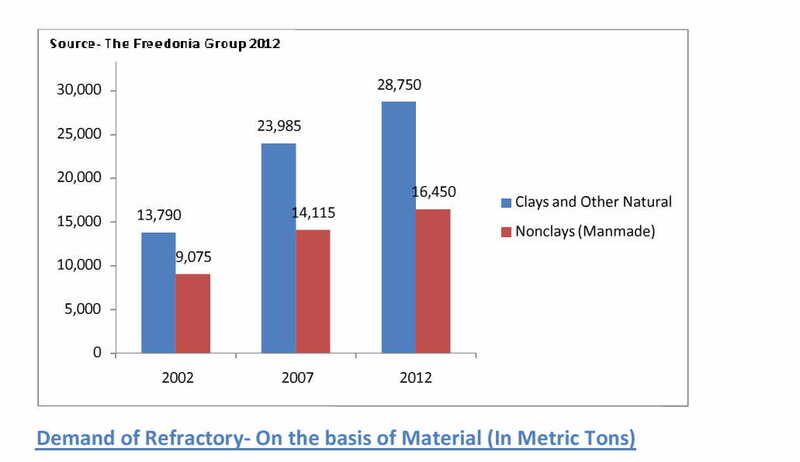 Raw materials account for 40% of total cost of refractory finished products (bricks and monolithic). Raw materials decide the quality of finished products and China has become the major suppliers of high volume raw materials. The major Suppliers of raw materials for Refractory in China: - Bosai Minerals, China Gengsheng Minerals, and Haicheng Houying. China's Raw Materials Policy is strongly implemented to safeguard the interests of Chinese Refractory. Exports of raw materials such as dead burned magnesia, refractory bauxite, and graphite are restricted and heavily taxed. 2. Export licenses are auctioned to selected domestic bidders only due to shortage; the export license cost by far exceeds the issue price. The Indian refractory Industry embarked its journey in 1854 in Kolkata, with the first line of production. In 2008, the Indian refractory Industry comprises of 100 established plants, 11 large plants, 24 medium- scale units and rest are small units. àThe production capacity of refractory in India is around 2 million metric tons. The organized refractory Industry had recorded a turnover of 3000 Crores in 2007-2008 as against Rs 2370 in the last fiscal year. àCurrently the companies in the Industry are operating at 60-80% of their total capacity utilization. India currently (2008) exports 10% of its total production. The Capacity utilization of Industry is around 65%. 1. China, with its cheap production. 2. Bargaining Power of Refractory makers is less, which is squeezed between raw material suppliers and steel makers. 3. Raw materials and Fuel Prices. 4. Unavailability of Skilled Workforce. 5. Marketing and Customized Product according to Customers’ needs. Refractory Plants are concentrated primarily near Steel plants- Orrisa, West Bengal, MP, Bihar and Tamil Nadu. It is interesting to observe in which direction, the refractory Industry moves and what would be growth of the Industry.